The commercial real estate development industry grew at the strongest pace since the economic recovery began in 2011, according to “The Economic Impacts of Commercial Real Estate,” an annual state of the industry report from the NAOIP Research Foundation, Washington, D.C. Author Dr. Stephen S. Fuller, director of George Mason University Center for Regional Analysis, finds the economic impact attributable to nonresidential development, which rose 24 percent over the previous year—the largest gain since the sector began to recover in 2011. A proposed standard under ASTM International’s Committee E60 on Sustainability, WK35702, Guide for Evaluation of Environmental Aspects of Sustainability of Manufacturing Processes, will assist users in adopting resource efficiency and environmentally friendly practices into daily operations. The first of two phases in the National Ready Mixed Concrete Association’s development of a standard Environmental Product Declaration (EPD)—aimed at assisting ready mixed producers on projects where customers target certification under the new LEED v4 green building rating system—has produced a survey report and list of participating companies and plants. The International Organization for Standardization’s new 14046, “Environmental management—Water footprint—Principles, requirements and guidelines” standard will allow a wide range of private and pubic entities the means to measure the environmental impact of their water use and pollution potential. It joins the ISO 14000 Environmental management series, whose “Type III Environmental Product Declarations” standard governs documents concrete interests are issuing as green building rating systems evolve. 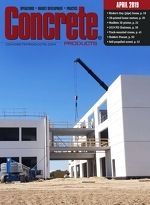 To support development of Environmental Product Declarations (EPDs) catering to contracts for green building certification candidate projects—especially those targeting the recently released LEED v4—producers and allied groups are finalizing a North American Precast Concrete Product Category Rule (PCR) through program operator ASTM International.